We’d love your help. 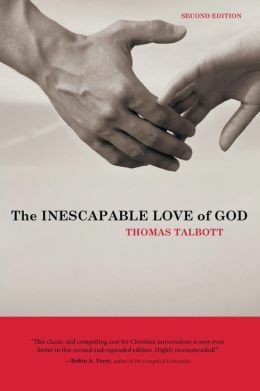 Let us know what’s wrong with this preview of The Inescapable Love of God by Thomas Talbott. To ask other readers questions about The Inescapable Love of God, please sign up. 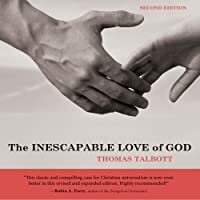 The "Inescapable Love of God," by Christian philosopher and California university professor Thomas Talbott, is a solid treatment on the subject of 'ultimate reconciliation' or Christian universalism - the belief that in time, over the 'aions' (eons = ages) - whether on this side of death or the other - ALL people - past, present, and future - will eventually be saved or reconciled to God. After all, the Bible does say that in the end, "Every knee shall bow and every tongue confess that Jesus Ch The "Inescapable Love of God," by Christian philosopher and California university professor Thomas Talbott, is a solid treatment on the subject of 'ultimate reconciliation' or Christian universalism - the belief that in time, over the 'aions' (eons = ages) - whether on this side of death or the other - ALL people - past, present, and future - will eventually be saved or reconciled to God. After all, the Bible does say that in the end, "Every knee shall bow and every tongue confess that Jesus Christ is Lord." [There are many, many other "ALL" statements in the Bible about salvation and God's 'reach' - feel free to look them up yourselves]. Christian universalists believe that even after great duress and after great chastisement, if necessary, the most wicked and hard-hearted will eventually and finally accept God - come to belief in His Son - and do so willingly. But universalists recognize that this acceptance/repentance can happen even AFTER one dies, though exactly how and when is not knowable for us on this side of the veil. Talbott's book is both scholarly and accessible to the average, every day reader. Again, 'Christian universalism' is the belief that, although for the unbeliever there does await after death an experience of painful chastisement and it is not something anyone would knowingly want to suffer, it does have a Godly purpose (remedial, corrective, purifying) rooted in God's love for us and it is not, contrary to popular belief, forever (though it may very well feel like forever). Some people are under the mistaken impression that Christian universalism is the belief that there is no 'hell' or 'Hades'. This is not correct. Also what is incorrect is the mistaken belief stemming from many (not all) of today's English Bible translations' use of the Greek word 'aionion' was correctly transposed by later Bible translators as meaning 'eternal' and that the word 'eternal' (from the Latin 'aeternus') means forever, endless, infinitely. Whether 'aionion' from the Greek or 'aeternus' form the Latin, the word incorrectly translated as 'eternal' does not mean 'forever' in either case. And although there is a TON of scholarly treatments on this subject alone (be prepared to 'go deep' on the subject or don't go at all!) - the meaning of the Greek words aion, aionion, etc. - the reader can go into all that on their own, and I would recommend it if you believe in 'unending torment' as I once mistakenly did. Anyway, Talbott's book amply covers that subject, as well. "Hope Beyond Hell." Although I was never really satisfied with the faulty 'endless/forever' translation and use of the word 'eternal' where it often should not have been used in the Bible - the Greek, Latin, and English Bibles were translated by men who, being flawed humans, did not have complete access to ALL (or as much) of the ancient linguistic information we now do - and, to be honest, some of them had 'less than honorable' agendas, or at least beliefs that were slightly skewed/flawed/biased. Sadly, because of the Bible mistranslations and much of the church's sometimes schizophrenic or abusive teaching on this serious subject, it has caused much confusion and unnecessary pain and fear for many people over the millennia. But universalism was the basic belief and teaching of the vast majority of Christians up to about the 4th and 5th centuries AD. You would be surprised how many well-known and respected Christian teachers/writers/preachers over the centuries were actually universalists, but unfortunately, you don't hear a lot about that these days. Their voices were drowned out by the more powerful, it seems. For myself, for several years, I have been unsatisfied and somewhat ambivalent about the commonly accepted teaching on a forever, endless hell fire. But in recent months, I have had a change of heart and mind and it has really been a much welcomed life changer! God is LOVE, just as the Bible says. To be clear, like all classic Christian universalists, and as the Bible teaches, I DO believe there DOES await an unimaginably UNpleasant experience of separation from God - popularly called 'hell' in English - for anyone who, despite being lovingly informed to the contrary while on earth, has still rejected or even hated God and His loving offer in his son Jesus Christ, regardless. But this choice of destination is OURS, not God's choice for us. And as Jesus said of those who are sent there, "I assure you, you will not get out until you have paid the last penny." But, only by God's grace and the help of a couple of good Christian friends, I've come to now understand that, as horrific as that place/experience will surely be for the unbeliever or God-hater - and no one should ever WANT to go there and experience it, at least there IS a 'last penny,' there is an end to it. Talbott's book is excellent. As a brilliant and seasoned philosopher of faith, he uses syllogism to devastating effect showing how both the Calvinist and the Arminian positions are false, leaving only the universalist position as the true. As Talbott illustrates, the Calvinist believes God is sovereign and all powerful, thus he CAN save everyone if he wants to, but for some reason chooses not to. The Arminian, on the other hand, believes God is ALL loving and desires everyone to be saved, but he is not powerful enough to do so! Thus, the Calvinist God is powerful but mean-hearted, saving only some and letting the rest go to hell 'forever.' The Arminian God is all loving and desires only our good - the good of all people - but he is too weak to bring salvation about for everyone. However, the universalist position shows scripturally God to be both ALL powerful and ALL loving - He loves ALL people and will bring EVERYONE to salvation, over the course of time, whether on this side of the veil of death or the other side. Yet he is just, fair, and impartial, i.e., there is the classic and oft-quoted example of the evil Adolf Hitler, for instance: yes, even he, too, will eventually be granted salvation, but not without first undergoing unimaginable sufferings in 'Hades' for his crimes. For how long and what that is like for him, we cannot know - we can only imagine. But we must all remember that we are ALL sinners and our sin - any sin - is an 'abominable stench in the nostrils of God,' to use an ancient analogy from scripture. NONE of us deserves heaven or endless life in God in our own merits, but may only gain it by the merits and accomplished work of the Son of God and his sacrifice on the cross for us all. God really IS love. Love is essential to His very nature. It's who He is. 'God is love' (1 JN 4:16) is not just a 'nice saying.' If the universalist position is false, as many Christians believe today, it means that the God-created Adam and his sin was more powerful than the Son of God - God in the flesh - and his saving work for us on the cross. I simply don't believe that. Do you? Lastly, I have gained a new understanding of Jesus' warning: "Judge not, lest you also be judged. For the measure with which you judge shall be used to against you." Here the Greek shows 'judge' to mean 'condemn.' So, do not condemn others. For no matter how long it takes and how we may eventually get there, we will ALL end up in the same place, with the Lord God through Christ Jesus, for "there is no other way by which men may be saved." And many of who think they are going to heaven may not be, at least at first. Therefore, do not condemn others but also take careful heed to the Lord's warnings - as well as encouragements - about the afterlife. It is a serious matter, more serious than we may know. Also, the parable about the vineyard and the workers going out at the 6th hour, 9th hour, etc. in Matthew 20 has a new meaning to me now. I have a very interesting and surprising understanding of that parable now. Many other verses have taken on a whole new meaning and new life. Very exciting, very encouraging! I love this book! Talbott takes us on a journey to find the real heart of God and shows us how off many of the Western theologians throughout history (Augustine, Calvin, Edwards, Acquinas, and modern conservative scholars) are. He makes a overwhelmingly persuasive plea that traditional theology is one of fear--where each human is either pre-determined to be saved or damned OR must freely choose (even if they are cut off from a true Christian message), but as a depraved sinner capable of falling I love this book! Talbott takes us on a journey to find the real heart of God and shows us how off many of the Western theologians throughout history (Augustine, Calvin, Edwards, Acquinas, and modern conservative scholars) are. He makes a overwhelmingly persuasive plea that traditional theology is one of fear--where each human is either pre-determined to be saved or damned OR must freely choose (even if they are cut off from a true Christian message), but as a depraved sinner capable of falling away, and where all deserve eternal torment by a retributive, exclusive God. Talbott makes an impassioned, reasoned case for the universal reconciliation of all humankind that is intellectually and scripturally honest--for example, it beautifully reconciles God's love with judgment and explains in depth why most have misread hell and the afterlife. This book is a breath of sweet air blowing away the stale inconsistencies of Western religious thought. Talbott does so much more here than simply present a grounded argument for universal reconciliation, from both Biblical and philosophical standpoints. He also confronts every possible objection he can find with a keen understanding of the discrepancies (no strawmen here) and rigorous, reasoned counter-arguments. You can tell he's almost afraid to leave any stone left unturned. Inescapable Love exposes the various ways in which both Calvinism and Arminianism fail to unite the Christian understanding of God as love and God as all-powerful (i.e. capable of getting what he wants in the end - and if what he wants is to reconcile the entire world to himself, then how can he fail, or be satisfied with failure)? He also draws out the universalist tendencies in Paul's letters that have so often been contested, in rather uneven ways, by Calvinists and Arminians. Most powerfully of all, he argues for hell as corrective in nature... not as a place God has created for eternal conscious torment, but as the inevitable metaphysical experience some souls have when they come into contact with the "consuming fire" of Love itself (the divine nature), which can do nothing else but expose, purify, and ultimately redeem. This clarifies what Paul means by God's "severe mercy" in Romans. In fact, once it's all laid out, there is so much Scriptural basis for UR that I'm finding it difficult to deny, as Talbott proposes earlier in the book, that the reason Christians have clung to eternal damnation as a doctrine for so long is due to the political history of the religion more than anything else. But there's further exploration and exegesis I'm excited to dive into on that front. In this book, Talbott makes a persuasive case for Biblical Christian Universalism. He not only goes into great lengths, biblically and logically, to explain why it is the viewpoint most consistent with Biblical teaching, but he also delves deeply into both the Augustianian/Calvinist and Arminian viewpoints and carefully deconstructs their teachings and philosophies; in this manner, he brings to light the numerous logical, philosophical and biblical contradictions and absurdities that make both v In this book, Talbott makes a persuasive case for Biblical Christian Universalism. He not only goes into great lengths, biblically and logically, to explain why it is the viewpoint most consistent with Biblical teaching, but he also delves deeply into both the Augustianian/Calvinist and Arminian viewpoints and carefully deconstructs their teachings and philosophies; in this manner, he brings to light the numerous logical, philosophical and biblical contradictions and absurdities that make both viewpoints intellectually and spiritually unsatisfying. Talbott also treats the issue of theodicy and does a marvelous job of explaining why an omnipotent God would allow--and indeed, MUST allow--free, moral agents to exist on this earth and why evil and suffering plays a necessary role in humanities' course. Talbott finishes with pointing to the greater hope for ALL mankind that will make even the greatest of temporal suffering seem like nothing in comparison. Good apologetic for Christian Universalism. This book reminded me why I could have never become a Presbyterian pastor. I read Thomas Allin's book, Christ Triumphant, back in 2015. It focuses on the theology of Universalism, and shows how it was a common way of thinking back in the days of the early Church Fathers, and beyond. But it was quite hard going because of its style of language. Talbott's book is much more accessible, though that doesn't mean to say it's always easy reading. For me it's an even more hopeful book than Allin's, partly because it uses Scripture as its base far more than Allin tends to do, a I read Thomas Allin's book, Christ Triumphant, back in 2015. It focuses on the theology of Universalism, and shows how it was a common way of thinking back in the days of the early Church Fathers, and beyond. But it was quite hard going because of its style of language. Talbott's book is much more accessible, though that doesn't mean to say it's always easy reading. For me it's an even more hopeful book than Allin's, partly because it uses Scripture as its base far more than Allin tends to do, and this helps to give strong support to Talbott's arguments. I came out of it feeling far more positive about God's love for all people, and believing that when Paul the Apostle writes the word all he really means it. Furthermore it helps to show why evangelism is still necessary even if a person does hold a theology of Universalism, and that was something I'd struggled with after reading Allin. A decent introduction to Christian Universalism. This was the first book that I read on the topic of Christian Universalism, and so far it remains the best. I first read it after undertaking a detailed study of the Calvinism/Arminianism debate, in which I became convinced that key passages (especially Romans 1-11) made the most sense when read as supporting the idea that God will eventually save all people. I couldn't reconcile this idea with the biblical passages about hell, or with my own notion of free will (following C.S. Lewis), so I turn This was the first book that I read on the topic of Christian Universalism, and so far it remains the best. I first read it after undertaking a detailed study of the Calvinism/Arminianism debate, in which I became convinced that key passages (especially Romans 1-11) made the most sense when read as supporting the idea that God will eventually save all people. I couldn't reconcile this idea with the biblical passages about hell, or with my own notion of free will (following C.S. Lewis), so I turned to this book to see whether there was really a case to be made. My criteria were that the argument needed to take full account of the core biblical and philosophical issues, and that it could not sweep any inconvenient facts under the rug; anything less would not do. It is apparent that Talbott wrote this book specifically for people like me (educated non-specialists, especially evangelicals, with just these criteria), and his book put my doubts to rest with an unmatched eloquence and philosophical sophistication. After opening by detailing a bit of his own personal journey, Talbott spends a bit of time unraveling the history of the doctrine of eternal hell. In particular, he sketches the development of this doctrine in the Western church, and makes note of the "legacy of fear and persecution" that this doctrine has led to for many centuries. This does not lend any positive support to Christian Universalism, but it does cast some face-value doubt on the main alternative. Moving forward, Talbott frames the issue by giving a list of three logicially inconsistent propositions: "(1) All human sinners are equal objects of God's redemptive love in the sense that God, being no respecter of persons, sincerely wills or desires to reconcile each one of them to himself and thus to prepare each one of them for the bliss of union with himself. (2) Almighty God will triumph in the end and successfully reconcile to himself each person whose reconciliation he sincerely wills or desires. (3) Some human sinners will never be reconciled to God and will therefore remain separated from him forever." He notes that while (3) is widely accepted and treated as non-negotiable by most modern Christians, there is profound disagreement among Christians about (1) and (2). By way of definition, those who accept (1) and not (2) are Arminians, and those who accept (2) but not (1) are Calvinists. But if someone were to accept both (1) and (2) - both of which are considered orthodox positions in and of themselves - they would logically have to reject (3); these people, including Talbott, are Christian Universalists. Thus (as in my own case), Christian Universalism can be seen as the logical synthesis of Arminianism and Calvinism, and this seems to undermine the idea that the position must be heretical. Next Talbott sketches a universalistic exegesis of Paul's epistles. He notes the absence of passages that are unambiguously about hell, and draws out the clear universalistic thrust of passages like Rom. 5 and 1 Cor. 15, especially emphasizing the clear parallel between the death that all experience through Adam and the life that all experience through Christ. He critiques the efforts of those who try to either explain these passages away with poor logic or else interpret them through the lens of other passages that supposedly teach of an eternal hell; Talbott demonstrates that there are at least as many, if not more, passages that seem to teach of universal salvation. Talbott also deals with Rom. 9-11, and argues that in this passage God's justice and mercy are actually two sides of the same redemptive coin; when vessels of wrath are "destroyed", they become vessels of mercy. Following this, Talbott dissects the case for eternal hell, arguing convincingly that Jesus' parables are indeed parables which are not necessarily meant to teach us about the afterlife, and that the Greek word that usually gets translated as "eternal" does not mean "neverending" or denote length in any way, but rather means something akin to "of the coming eschatological age". Thus Talbott interprets the hell texts to be talking about a sort of purgatory, a restorative rather than a retributive punishment, one which leads to life rather than to death. Finally, Talbott argues for the biblical notion that God is Love at bottom, and thus everything He does must ultimately be loving, not just to Christians but to all people. All of this points to a distinctively Christian form of universalism, which successfully preserves the broad outlines of Christian doctrine and eschatology while throwing out the notion that hell must be neverending. Next, Talbott moves from exegesis to philosophy, and this is where he truly shines. He talks about "the paradox of exclusivism", and about the natures of love, punishment, forgiveness, omnipotence, and human freedom. This section of his book is long and philosophically rich; my main note here is about Talbott's idea of human freedom. He rejects strict determinism, but he also rejects completely libertarian freedom on the grounds that it is most likely incoherent, and that at any rate no human is competent to choose their own eternal destiny. The alternative which he presents is a picture in which humans come to self-awareness in an environment of uncertainty and ambiguity, thus in an environment which allows for some indeterminancy in the way humans behave; but because humans are rational and God cannot deceive us, we must eventually learn about the true nature of reality and thus of God (whether in the here and now, or in the afterlife when suffering the consequences of our sin), and when this happens we cannot but help turn to Him. I originally found this book while reading a blog by a young man who suffered from scrupulosity, a type of OCD where the person develops intense fear around the concept of hell. He credited this book with restoring normalcy to his life, and I thought it must be a powerful read. It is powerful, and information packed. I previously read Love Wins by Robb Bell, and was disappointed with that book because it seemed to skim over ideas and issues, and was light on the history behind Christian thought. I originally found this book while reading a blog by a young man who suffered from scrupulosity, a type of OCD where the person develops intense fear around the concept of hell. He credited this book with restoring normalcy to his life, and I thought it must be a powerful read. Great biblical and philosophical arguments that God necessarily loves all his creatures and ultimately will reconcile all to himself. He also spends a good deal of time detailing how historically the church came to embrace the concept of unending conscious torment in Hell. The logical arguments are so convincing that you will be shocked that you ever thought of God any other way. Christians also might go into denial that the church could be so wrong about such a big topic. But alas, the biblical arguments are equally convincing. So in the end you have reason, logic, scripture, the Holy Spirit, and a surprisingly rich history to lean on. Therefore, the traditions of man must yield. This is the book that you will see referenced time and again when you delve into the study of apokatastasis or universal reconciliation. If you want to read something other than a characterization of the Christian view of Universal Salvation in Jesus then this is the book you want to read. Amazing philosophical arguments. Pretty good biblical arguments. This book didn't bring me fully over the line into believing in Universal Salvation, but it did build my respect for that position. I am definitely going to read this book several more times. There is so much to chew on! I am a conditionalist, but I approached this book with an open mind. The author makes good arguments for universalism based on exegesis and philosophy. Although I am not yet 100% convinced, I have much more respect for this view now. Tablott's arguments are much more persuasive and thorough than I had expected, even as someone who agrees with him on a lot of his major points. This book is absolutely essential reading for anyone interested in Christian universalism. Probably the definitive book on Christian universalism. An eschatological earthquake for anybody who was taught to fear the possibility of eternal torment. Third (or maybe it’s fourth) time reading it, love it more each and every time. A more philosophical approach to Apokatastasis. Profound. Moving. Revelatory. In a world dominated by (non-eastern) religions that teach 'God' who is said to be both absolute in power AND love MUST abdicate one of those traits and hence lose most of His creation; here comes a book that beautifully and inspiringly shows (teaching from the very same scriptures that *most 'Christians' use amazingly enough) that ultimately the OPPOSITE outcome will come to pass, NOT the fate they insist their tyrant hell-fire terrorist God demands. A book that eve Profound. Moving. Revelatory. In a world dominated by (non-eastern) religions that teach 'God' who is said to be both absolute in power AND love MUST abdicate one of those traits and hence lose most of His creation; here comes a book that beautifully and inspiringly shows (teaching from the very same scriptures that *most 'Christians' use amazingly enough) that ultimately the OPPOSITE outcome will come to pass, NOT the fate they insist their tyrant hell-fire terrorist God demands. Talbott wrote this book long before Love Wins and really did his research. I find it a bit technical and hard to follow sometimes, and don't agree with everything here, but still find it to be an excellent book. Other great books on the topic are Hope Beyond Hell, Raising Hell and Christian Universalism: God's Good News for All People. Talbotts arguments are too strong and being a philosopher his logic painfully clear, he does away with the popular concepts that hell goes ''forever'' and the idea that GOD snuffs out the wicked and paints a picture of magnificence that logically encompasses all men. he shows that punishment against the wicked has a purpose, one in which the intention is rehabilitation, so the ultimate outcome for mankind is mind-blowing bliss. its referred to as good news for a reason. I found this a very helpful book as I try to clarify my theological beliefs after many years of wrestling with the calvinism/arminianism debate. Talbott's own Christian background and journey resonate deeply with my own and I appreciate the clear, scholarly and fair-minded way he strongly argues his case for universal salvation, both from a biblical and a philosophical viewpoint. Talbott makes a good philosophical case for Christian Universalism. I was hoping to see a bit more Biblical support for his case, and his writing style can, at times, be very academic and dry. However, on the whole, I'd recommend this book to anyone interested in Universalism, what it is, what it means, and is it possible. Excellent. Philosophical. Theological. Deep thought. The most honest book I have read thus far on universal reconciliation. Very thorough. Very helpful. In this book, Talbott sought to "work out, with some degree of consistency, the idea that the universe really is an expression of love, as some of the mystics from many traditions have always insisted." A book that help solidify a major shift in my thinking about how vast and powerful God's love really is. Philosophical, historical and biblical support for God's love bring powerful enough to actually accomplish what God wants - for everyone, yes, everyone, to be in a loving relationship with him by choice. This is the best, most theologically and scripturally grounded book I have read on the hope for universal reconciliation. It goes against everything I have been taught but I find the book intelligent, gracious and hopeful. Is he onto something? In one word: great! This book is an eye opener on the tremendous love God and His firstborn Son Jesus Christ have for humanity. It combines philosophy with theology to paint a convincing picture that in Christ all humanity will eventually be saved. Cory Shumate Although I ultimately disagree with Talbott, he presents the best case for universalism I have come in contact with. Though a philosopher by trade, he is committed to careful exegetical reasoning, and makes a profound case for universal reconciliation. Is the character and nature of God, his very essence love? Can this God truly send his children to a hell of eternal conscious torment? I highly recommend this thought provoking book. After 34 years of teaching philosophy at Willamette University in Salem, Oregon, I retired from full-time teaching in 2006. My principal area of interest and the area in which I have done most of my own writing is philosophy of religion--which, of course, overlaps with metaphysics, epistemology, moral philosophy, philosophy of mind, and virtually every other area of philosophy. See also my Willame After 34 years of teaching philosophy at Willamette University in Salem, Oregon, I retired from full-time teaching in 2006. My principal area of interest and the area in which I have done most of my own writing is philosophy of religion--which, of course, overlaps with metaphysics, epistemology, moral philosophy, philosophy of mind, and virtually every other area of philosophy.